As usual, this post stems from a need to use up ingredients from Costco. This time – milk and cream. There is only so much custard a girl can eat (and I didn’t want to go to the store for eggs) so I decided to branch out. What kinds of options did that give me? Maybe chowder or another soup? Too hot. Maybe ice cream? Nope, the ice cream maker core was removed from the freezer to make room for more Costco! Cheese, perhaps? That sounded difficult. I didn’t think I would have the proper ingredients or, frankly, the patience for the process. Ricotta cheese is one of my favorite ingredients. It is so versatile and fresh. There are a million things you can do with it. One of my favorite recipes for ricotta is my ricotta ravioli. I also love ricotta cakes, pancakes, and, of course, a big, gooey, delicious lasagna. 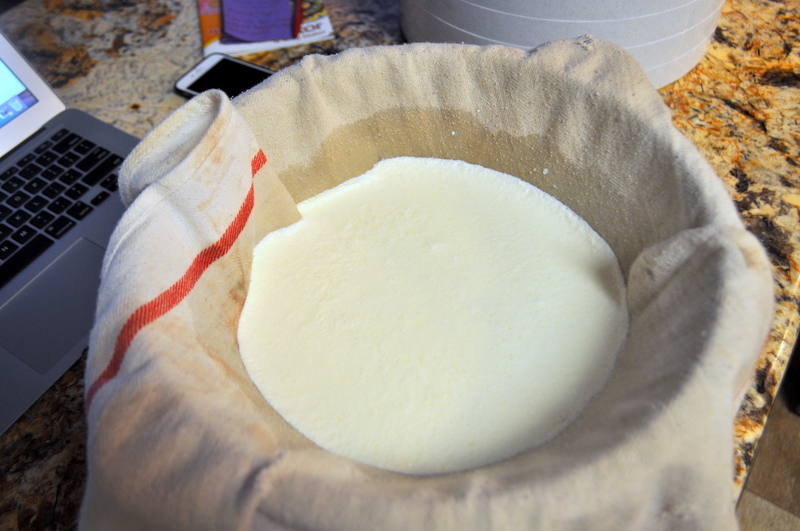 I can’t wait to make all sorts of wonderful ricotta recipes with this batch of cheese. I also LOVE ricotta cheese. I’ve tried my hand at a couple other easy cheeses and I love making homemade yogurt, so I need to give this one a try. Thanks for the recipe! So ridiculously easy, isn’t it? Well done! This is featured on Funtastic Friday this week. It’s an awesome recipe, and one that I plan of trying. Thanks for linking up and sharing with us. Hope you join us again this week.